토함산 동남쪽 계곡의 비교적 높은 곳에 자리하고 있는 통일신라시대의 절터이다. 절터가 있는 계곡은 대종천의 상류로 감은사터 앞을 지나 동해로 흘러간다. 절을 지은 연대나 절의 이름은 전해지지 않는데, 장항리라는 마을 이름을 따서 장항리사지라 불러오고 있다. 절터에는 서탑인 5층석탑과 파괴된 동탑의 석재, 그리고 석조불대좌가 남아 있다. 금당으로 보이는 건물터에 있는 석조불대좌는 2단으로 되어 있는데, 아랫단은 팔각형으로 조각이 새겨져 있고 윗단은 연꽃을 조각한 원형대좌이다. 이 대좌 위에 모셔졌던 것으로 보이는 석조불상은 여러 조각으로 파괴된 것을 복원하였으며 현재는 국립경주박물관에 있다. 서탑은 일제시대에 도굴범이 탑 속에 들어 있는 보물을 훔치기 위해 폭파시켜 파괴한 것을 수습하여 다시 세웠다. 동탑은 계곡에 흩어져 있던 것들을 절터에 모아두고 있다. 장항리사지는 계곡 사이의 좁은 공간을 이용하여 쌍탑을 세우고 그 뒤쪽 중앙에 금당을 배치한 점이 주목할 만하다. 쌍탑 1금당으로 통일신라시대의 전형을 보이나, 아직 강당과 회랑의 자리는 밝혀지지 않고 있다. 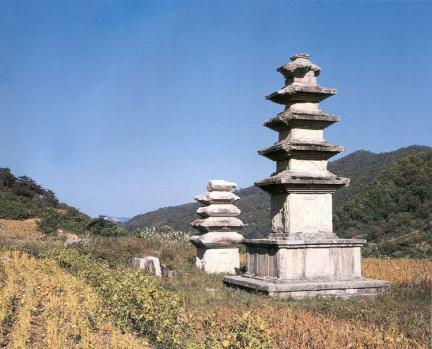 A Buddhist temple of the Unified Silla (668~935) once stood here, southeast of the summit of Tohamsan Mountain, as evidenced by two pagodas. A valley near the temple site is the upper stream of Daejongcheon that flows to the east sea. Neither the construction date nor the name of the temple is known, but this temple site is named Janghangnisaji after the town, Janghang-ri. The temple grounds appear to have been rather small. The main hall stood on a foundation, and some stones used in the foundation and the stairs in front of the main hall remain. Judging from the number of square corner stones, the hall is believed to have been 3kan wide and 3kan deep (kan is a traditional unit of measurement referring to the space between two columns). At the center of the main hall is a two-tiered pedestal for an image of Buddha. Buddhist guardians and beasts are carved on the sides of the octagonal lower part 60cm high and 2.4m at the widest part. The round upper part has height of 53cm and diameter of 1.84m. Lotus flowers adorn the upper part. The West Pagoda, about 15m from the site of the main hall, was restored in 1932 after it was blown up by relic robbers. Some stones from the East Pagoda, which were found scattered along a nearby valley, were brought here. The two pagodas are believed to have been of the same type and size. The image in the main hall was presumably a standing stone Buddha more than 4m high. Its fragments were taken to Gyeongju National Museum during the restoration of the West Pagoda in 1932. Noteworthy are the election of two pagodas and placement of the main hall at the center of the back in this small area between the valleys. The two pagodas are typical of the Unified Silla pagodas. The sites of an auditorium and an ambulatory were not recovered, however.